Leawo Video Converter is a suitable tool to convert between all kinds of videos while it can help you adjust the videos to a desired size, say smaller file for space saving. It involves the knowledge on codec settings, a set of essential parameters for the task. It is easy to learn after all and here is a step by step guide on how to reduce the size of your video file with Leawo Video Converter. Step 1, load the videos into Leawo Video Converter for processing. It accepts more than a score of popular video formats, so there is no worry for incompatibility. Step 2, select a profile for the file you selected. More than 100 profiles, with reference to common video formats and particular terminal formats, are in crisp order. You may judge on the file extension and the description for one that matches your need. Step 3, assuming you have assigned a 3GP profile, then click “Settings” to open codec settings panel. There is a full list of codec settings, dividing into two parts, for you to make distinct differences. Video Codec: it is to determine which arithmetic to use in encoding the video. If you have ever uploaded videos to YouTube, you should be acquainted with YouTube’s recommendations on uploaded video format, which are H.264, MPEG-2 and MPEG-4. 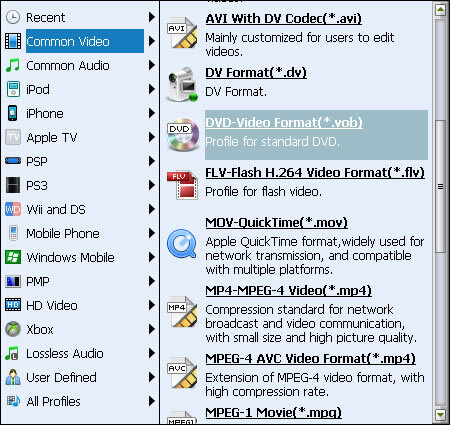 Leawo Video Converter has many codec plugins to cover most picky demands. Quality: it specifies how much the video quality is to preserve after conversion. High quality usually brings good details on screen with the only holdback of large file size. It is recommended for video backup or broadcasting. When you want to view the video on small screen or memory-tight terminals, low quality is the best choice. Bit Rate: it describes the bits per second in the video stream, reflects the video quality and video size in number form. Video Size: namely the actual resolution of the video display in full size. Frame Rate: it gives the idea of the frames per second in the video stream. A smooth video usually adapts a frame rate higher than 24. If the video contains mostly intense shots, a higher frame rate is required. Otherwise, you can lower the frame rate and reduce redundant frames in a slow motion video. Aspect Ratio: it affects the display style on your player. 4:3 is preferred aspect ratio for TV or standard CRT screen, while 16:9 is often favored by wide screen LCD screen. Audio Codec: same to video codec, except it is dedicated to audio. A moderate choice is MP3 for its widespread popularity around cyberspace. AAC features a better performance in a smaller file size, preferred on memory-tight cell phones or PMPs. AMR is the best choice for carrying voice because of its slim body, but not suitable for music enjoyment. Bit Rate: same as video. Usually a video file would contain both video stream and audio stream, so the total bit rate will be the sum of video bit rate and audio bit rate. Sample Rate: a factor that determines the details of audio. It goes the same as Frame Rate. Channels: an audio stream can be single channel (mono), double channel (stereo) or even 5.1 channel (surrounding). It can be easily determined by how many sub sound boxes you have in your audio system. There are some important rules to follow before you start the conversion. 1. do not apply a profile with parameters higher than the present of your video file. It simply doesn’t improve the quality but results in unnecessarily larger file. 2. the higher is not always the better. For example, you might experience frame drop while watching H.264 videos on your PMP but not the case with MPEG-4. The reason is that your PMP is not strong enough in decoding advanced but complicated format like H.264, so you have to make do with MPEG-4 or MPEG-2. 3. better not raise too high on frame rate, sample rate and bit rate. Blind pursuit for higher figure does not guarantee a better result, but increase the possibility of low efficiency, such as redundant frames and bloated file size. After absorbing quite an amount of knowledge on codec settings, you must eager to practice for the very first time on your own. 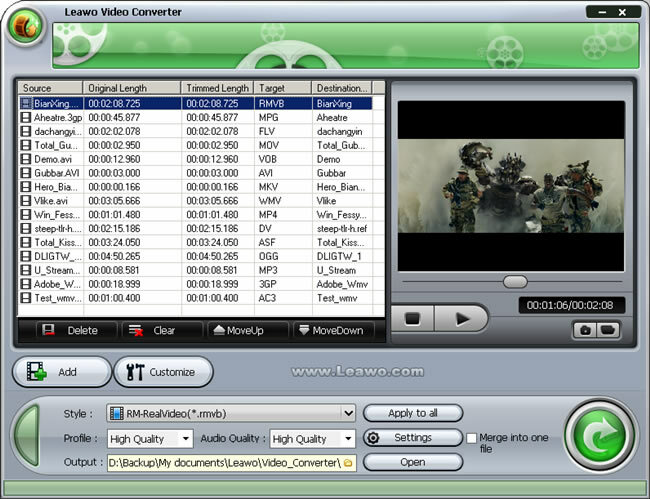 Leawo Video Converter provides comfortable experience during conversion, such as batch converting and after done actions, brings the task easier and faster to its goal. Leawo Video Converter is now on promotion with a big discount, which is a real boon to all users. Anyone seeking an all-in-one converting solution would be remiss to not check it out. How to get screenshot from my video file with Leawo Video Converter? How to crop video for my players with Leawo Video Converter? How to join videos to enjoy a video show with Leawo Video Converter?